The Obama Administration's campaign of providing simulacra of change is failing; the propaganda of hope is no substitute for true reform. The Obama Administration has about six weeks to completely renounce its simulacra of reform in the nation's finances, healthcare and military affairs, or it is doomed to repudiation and defeat in the November 2010 elections. Meanwhile, the propaganda machine is churning out claims that the administration "rescued the economy from the abyss" when in fact the only group rescued was the Elite who stood to lose billions when their sandcastle of overleveraged risk collapsed under its own weight of lies, chicanery, embezzlement and systemic fraud. Now the administration's propaganda machine is declaring victory over spiraling healthcare costs-- by adding another trillion dollars to the nation's bloated, failed sickcare system's already out-of-control costs. Does any part of this 2,000-page "reform" address the nation's failing health, or that we spend twice as much per capita as other developed democracies (Australia, Japan, Sweden, Germany, et al.) on "healthcare" which fails miserably to improve our collective health? No, it does not. The "reform" is entirely a simulacum of reform which leaves the sickcare cartels firmly in place. What makes it truly a travesty of a mockery of a sham is that this "reform" does not even raise the issues of fundamental reform: for instance, the fee-for-service model I address in Is Fee-for-Service What Ails America's Health Care System?. 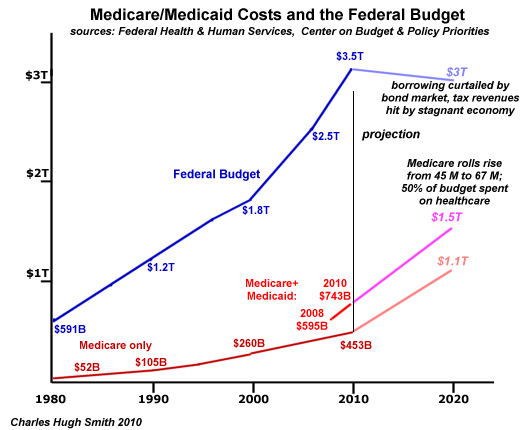 Keep this is mind: Medicare/Medicaid and/or the Federal budget will start imploding by 2013. Just borrowing another few trillion isn't going to solve anything, and that will soon become abundantly apparent. We cannot place the entire blame for the nation's self-hypnosis, hubris, denial and whiny sense of entitlement at the feet of the Obama Administration, but we can say that offering facsimiles of reform and trumpeting bailouts of the status quo with money borrowed from our grandchildren as "accomplishments" has deepened the nation's ethical and financial abyss. Many observers take the President's character, detachment and other personal traits as the root cause of his administration's Grand Failure; from long observation of presidents, this strikes me as a superficial and inconclusive analysis. After all, Presidents Ford and Carter were both widely mocked as stumbling, incompetent, etc., yet each has come to be appreciated for characteristics which were either under-appreciated or unleveraged in their administrations. The President should not be measured as an individual, but as a leader of a team of his own choice: his administration. Thus weak presidents can be strengthened by competent, experienced senior staff, and potentially strong presidents can be fatally weakened by an administration dominated by sycophants, toadies, cronies, factotums, financial contributors, Rasputin-like ideologues, etc. What is abundantly clear is that the Obama Administration's central strategy is to offer facsimiles of reform as "the real thing:" the classic definition of simulacra as described in Survival+. The goal is clear: don't step on any toes of entrenched special interests and powerful cartels. Placate every major player and every ideological camp. Manipulate public opinion via a stock market which melts ever higher, statistical legerdemain (the recession is over, GDP is growing at 2.2%--but sales and income taxes are still falling by 7% in December....hmm) and other "green shoots" propaganda in the hopes that a real, "organic" cycle of growth and hiring will actually take hold from the trillions squandered on "saving the status quo." And we're supposed to be soothed by what amounts to a $9 billion annual tax (assuming it won't be watered down--a faint and foolish hope) after handing the financial Elites $3 trillion in backstops, guarantees, no-interest loans, full redemptions of AIG credit-default swaps, and countless other giveaways? President Obama (or perhaps the entire Administration) is either tone-deaf or calculating in an admirably Machiavellian way: by now, everyone in a position of power knows the public's memory spans a few weeks at best, and that its capacity for self-delusion, media distraction, self-pity, denial and permanent adolescence are essentially limitless. All the manipulator need do is wait the public out until it forgets. Unfortunately for the Obama Administration and its Masters in the Power Elite, it's difficult to forget that your unemployment is running out, that you no longer have health insurance (or can't afford the insane COBRA payment), that costs for essentials keep rising despite the "news" that "there's no inflation," and that your child or family member is stationed in a no-win, dead-end war in Afghanistan. So far, the Administration's strategy is still working because there are no visible consequences of borrowing $1.5 trillion a year to fund all the special interests and cartels. But if the wheels fall off any of the simulacra, or if rising interest rates or some other disruption in the global shell game triggers some real-world consequences to that stupendous borrowing, then the public's distraction and denial might dissipate, leaving a hard, cold anger at the deception and manipulation at the heart of their State--not just the Federal government, but state and local governments as well. Were that awakening to occur prior to early November, 2010, the politicos and Power Elites who issue their marching orders might be surprised to find that their simulacra and con games failed. Perhaps this too is a vain hope. Do I care if the Republocrats or Demopublicans win? No. They are two sides of the same coin. (Survival+ 101) But some entrenched incumbents losing power would be a welcome signal that the public is not quite as distracted and manipulated as they appear to be. Thank you, Todd O. ($12), for your much-appreciated generous contribution to this site. I am greatly honored by your support and readership. Thank you, Richard K. ($20), for your very welcome generous contribution to this site. I am greatly honored by your support and readership.